Last week of the 2016/17 NFL season is in the books and fans have been treated to some nail biters, blowouts and upsets so far along with several excellent individual performances from the league’s most exciting players. NFL Week 3 kicks off Thursday, Sept. 22nd and we can expect the same from the upcoming 16 games. Let’s take a quick look at each contest and see who’s likely to come out on top of them. The Patriots are off to a 2-0 start even though star quarterback Tom Brady is suspended for the first four games and Rob Gronkowski is shelved with an injury. New England took care of Miami 31-24 last week. Unfortunately for the Patriots, Brady’s replacement Jimmy Garoppolo suffered an injury and is questionable for the matchup against Houston. If Garoppolo can’t start, it looks like rookie Jacoby Brissett will get the nod. On the bright side, Brissett will have the home crowd behind him in his NFL starting debut. New England is 9-1 in their last 10 home games and 6-1-3 ATS. Houston is also 2-0 on the year after downing the Kansas City Chiefs 19-12 on the road last week. The Bills were 37-31 losers at home to the New York Jets last week and are 0-2 on the season while the Cardinals blew out Tampa Bay 40-7 at home and are now 1-1. Arizona quarterback Carson Palmer had an excellent outing with three touchdowns, 308 yards in the air and no interceptions. The Cardinals’ defence was at its best as Tampa quarterback Jameis Winston couldn’t get anything going. Meanwhile, the Bills played a decent game, but came out on the wrong end of the decision to the Jets and need to be more consistent on both sides of the football. Both Oakland and Tennessee are 1-1 this year after the Raiders dropped a 35-28 decision at home to Atlanta and the Titans edged Detroit 16-15 on the road. The Raiders defence was leaky last week as Atlanta quarterback Matt Ryan and his teammates racked up 528 yards of offence. However, the Oakland offence did its part by scoring 28 points and had close to 500 yards themselves. Oakland needs to tighten up defensively if they hope to take out the Titans. Tennessee quarterback Marcus Mariotta threw a pair of touchdown passes to Delanie Walker and Andre Johnson and had 238 yards in the air against the Lions with Walker leading the way with six catches for 83 yards. Prediction: Oakland wins by four points, 28-24. Cleveland enters the game at 0-2 after dropping a 25-20 decision at home to Baltimore and Miami is also 0-2 after going down 31-24 at New England. Cleveland blew a 20-point lead against the Ravens as they allowed Baltimore to score the final 25 points of the game during the last three quarters. But on the bright side, both running back Isaiah Crowell and wide receiver Corey Coleman had fine outings and could carry the momentum against Miami. Crowell carried the ball 18 times for a game-best 133 yards and scored a touchdown while Coleman led the receivers with 104 yards on five receptions. Cleveland’s defence is a liability though and is averaging 27 points against per game so far this season. As for Miami, they average 269.5 passing yards per outing and wide receiver Jarvis Landry caught 10 of 13 passes against the Patriots for a total of 137 yards. Prediction: Miami wins by 14 points, 28-14. Baltimore stormed back with 25 straight points to beat Cleveland 25-20 on the road last week to improve to 2-0 while Jacksonville was humbled 38-14 in San Diego by the Chargers to fall to 0-2. Ravens’ quarterback Joe Flacco woke up just in time to lead the comeback in Cleveland and finished the game with a pair of touchdown passes and 302 yards in the air. However, he was picked off twice in the first half. Jacksonville has allowed 32.5 points per game on average this season and that will need to change quickly if they hope to win on Sunday. Baltimore has problems in Jacksonville though and hasn’t won their since 2001. Prediction: Jacksonville wins their first game by three points, 24-21. Detroit was edged 16-15 at home by Tennessee last week to fall to 1-1 while Green Bay was downed 17-14 in Minnesota to drop to 1-1 on the season. Detroit entered the fourth quarter with a 15-3 lead over the Titans, but couldn’t hang onto it. Lions’ quarterback Matthew Stafford passed for 260 yards and a touchdown and will need a better outing this week. Green Bay is 5-5 ATS and 7-3 in their past 10 home encounters and has won two of their past three meetings with Detroit. Denver downed Indianapolis 34-20 at home last week to improve to 2-0 while the Bengals were beaten 24-16 in Pittsburgh by the Steelers and are now 1-1. Denver’s Von Miller, last year’s Super Bowl MVP, recorded three sacks against Colts’ quarterback Andrew Luck and Luck was limited to just one touchdown pass and fewer than 200 passing yards. The Broncos’ defence is as good as ever and will be tested since the Bengals’ offence has averaged 396.5 yards per game. Denver quarterback Trevor Siemian has struggled though as Peyton Manning’s replacement and is due to break out sooner or later. Prediction: Cincinatti wins by four points, 21-17. The Vikings won a close 17-14 decision at home to Green Bay last weekend to go to 2-0 while the Panthers were 46-27 victors at home against San Francisco to improve to 1-1. Minnesota lost last year’s rushing leader Adrian Peterson as he was injured against Green Bay and left the contest in the third quarter with a right-knee problem. It’s still unclear how long he’ll be out of action, but it could be several weeks as he has a torn meniscus. In addition, the Vikings are already without injured quarterback Teddy Bridgewater for the season. This means Minnesota quarterback Sam Bradford may rely on a passing game with wide receiver Stefon Diggs becoming the main target. Diggs had a fine game against the Packers with 182 yards on nine receptions and a touchdown. However, he may find the going tougher against the Panthers. Carolina has the sixth-best pass defence in the league at the moment and has won 10 straight at home while going 8-2 ATS in those games. Prediction: Carolina wins by three points, 24-21. Washington is winless after two weeks following their 27-23 home defeat at the hands of Dallas last week while the Giants are 2-0 after their 16-13 home triumph over New Orleans. Washington quarterback Kirk Cousins has thrown just one touchdown pass so far this campaign and has been picked off three times. Needless to say, he needs to improve if Washington has any hope against the Giants or anybody else for that matter. The Giants are playing well on both sides of the ball and have averaged 278 passing yards per game so far. In addition, the defence has held the opposition to under 20mpoints each outing. On the downside, New York has been beaten six of their past 10 home contests. Prediction: Giants win a close one by five points, 31-26. The Rams are 1-1 after moving back to Los Angeles following their low-scoring 9-3 home win over Seattle last week. Tampa sits at 1-1 after being drilled 40-7 in Arizona by the Cardinals. The Rams defence shut down Seattle and relied on three field goals by Greg Zuerlein to win last Sunday. In fact, Los Angeles hasn’t scored a touchdown so far this campaign, but will likely break that slump against a Tampa squad that lost by 33 points to the Cardinals. Tampa’s defence has to improve if they hope to edge the low-scoring Rams. Prediction: Los Angeles wins by four points, 26-22. San Francisco was thumped 46-27 in Carolina last weekend to fall to 1-1 on the year while Seattle was held back by the Rams in a 9-3 road defeat. San Francisco was in the game against the Panthers for the first half as they trailed by just seven points. However, they more or less fell apart after that. They’ll need a consistent four-quarter effort if they hope to upset Seattle. The Seahawks struggled offensively in Los Angeles with a lone field goal to their name, but the defence was pretty solid. Prediction: Seattle wins by seven points, 28-21. The Jets got past the Bills 37-31 in Buffalo last week to improve to 1-1 while the Chiefs are also 1-1 on the season following a 19-12 road loss in Texas to Houston. Jets’ running back Matt Forte carried the ball 30 times for 100 yards against the Bills and scored three touchdowns along the way. Receivers Brandon Marshall and Eric Decker teamed up for over 100 yards each as they caught for a total of 227 yards. The Kansas defence has struggled so far by allowing a minimum of 388 yards in each of its first two outings. The Jets are 3-7 ATS and 5-5 straight up in their past 10 meetings with Kansas City. Prediction: New York Jets win by five points, 26-21. Indianapolis is looking for its first win after losing 34-20 in Denver on the weekend while San Diego dropped Jacksonville 38-14 at home to fall to 1-1. Colts’ quarterback Andrew Luck was as hot as a pistol in the season-opener against Detroit with four touchdowns and 385 passing yards, but didn’t win and was then sacked five times in Denver. Meanwhile, the San Diego defence held Jacksonville to 14 points, but needs to play the same way on the road. The Chargers surrendered 413 yards their week-1 defeat in Kansas. Prediction: The Colts win their first game by 10 points, 32-22. The Bears are now 0-2 on the new season after falling 29-14 to Philadelphia on Monday night. They’ll be facing a Dallas club that enters the game at 1-1 following their 27-23 win in Washington. Chicago quarterback and linebacker Lamarr Houston were both hurt against the Eagles and are questionable for Sunday’s game. If Cutler can’t play then Brian Hoyer should start. Alshon Jeffery has been playing well for the Bears with 201 yards on nine receptions while running back Jeremy Langford hasn’t had much of an impact even though he’s rushed for a pair of touchdowns so far. Dallas is playing Dak Prescott at quarterback while Tony Romo is out injured, but the offence is still dangerous. Chicago is 3-2 both ATS and straight up on their last five road trips while Dallas is 0-3-2 ATS in their last five at home. Prediction: Dallas doubles Chicago by 14 points, 28-14. The Steelers and Eagles both enter the game with 2-0 records. Pittsburgh downed the Bengals 24-16 at home last time out while Philadelphia dropped Chicago 29-14 on Monday. This is an NFC North showdown which has the potential to be the best game of the weekend. The Steelers’ DeAngelo Williams ran for 94 yards on 34 carries against the Bengals and also caught a touchdown pass. He’ll be relied on again as running back Le’Veon Bell is still suspended for one more game. Quarterback Ben Roethlisberger was picked off twice and completed 19 of his 37 pass attempts as he finished with three touchdown passes and 259 yards in the air. The Steelers’ defence has allowed just 32 points in two games and Pittsburgh is 4-2 on their past six road trips. Eagles’ quarterback Carson Wentz is 2 for 2 on the year and this year’s draft choice hasn’t turned the ball over as of yet. Prediction: Pittsburgh wins by 14 points, 33-19. Atlanta enters the game with a 1-1 record after their 35-28 win in Oakland over the Raiders. 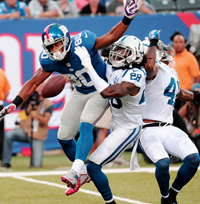 Meanwhile, New Orleans was edged 16-13 in the Big Apple by the New York Giants. Atlanta racked up more than 500 yards last week as quarterback Matt Ryan led the way with three touchdown passes. He’ll be facing a Saints team which has allowed an average of 336 yards in the air in each of its first two contests, which ranks third-worst in the league. On the other side of the coin, the Saints are averaging 333 passing yards so far this season and will cause an aerial problem for Atlanta. Prediction: New Orleans wins by seven points, 31-24.